Winter fruit salad with lemon poppyseed dressing | Winter fruit salad with lemon poppyseed dressing – oh, that's tasty! This is one of my favorite salads, and it always gets rave reviews. I don’t make it as much now that we’re eating low carb, but you could certainly swap out your sweetener of choice for the sugar. And you could reduce the amount of sugar or sweetener needed by substituting orange juice for the lemon juice. The first time I made this recipe, I was almost out of lemon juice so I used half lemon, half OJ, and it was quite tasty. Of course, you can swap out pecans or sliced almonds for the cashews, but I think the saltiness adds a nice contrast to the sweetness of the other ingredients. I also like to use smoked Swiss — or smoked Gouda, if I have it — for the plain Swiss. It’s a subtle addition, but I think it adds to the winteriness of the dish. 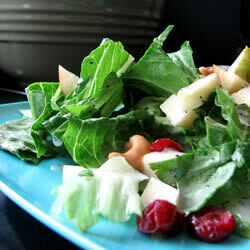 Make-ahead tip: Mix up the dressing, then chop the apples and pears and toss them with a little dressing. The citric acid in the dressing will keep the apples from turning brown. You can also prep the cheese, craisins and cashews and put them together in a container or baggie. Then when it’s time to serve, just dump the dressing, fruit and topping mixture over your greens and toss. If you dump dressing or anything with salt and sugar in it on the lettuce ahead of time, it will begin to wilt immediately, as these chemicals break down the cell walls of plants.